RAM Telecom International, Inc. (RTI) and the University of Hawaiʻi System has signed a multi-year, multimillion dollar IRU agreement to supply transpacific fiber system capacity to the university. RTI will provide the capacity on the Southeast Asia-United States cable system (SEA-US). Upon its completion targeted for end of 2016, SEA-US will link five areas and territories including Oʻahu (Hawaiʻi), downtown Los Angeles (California), Piti (Guam), Manado (Indonesia) and Davao (Philippines). 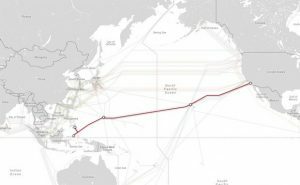 SEA-US is among the first transoceanic cables deploying 100 gigabits per second state-of-the-art ultra long haul optical fiber transmission technology. To view the full size SEA-US map, visit the TeleGeography Submarine Cable Map website. – The SEA-US cable system. Image credit: PriMetrica, Inc.